Standard material is M42 steel (8% Cobalt) which is much tougher than the M2 high speed steel typically used for this type of annular cutter. Unibroach drills have more cutting teeth, which reduces individual tooth loading. Cut holes easier, more efficiently in tough-to-cut metals, such as stainless steels. 3/4" diameter shanks: use Hougen, Jancy, Bosch, Black & Decker and similar magnetic drilling machines with 3/4" arbor collets. 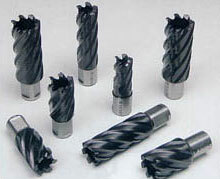 Or use our Morse Taper arbors to adapt to a wide variety of production-line machine tools. Available with Weldon shanks for additional machine adaptability. Fractional and metric sizes: Standard sizes up to 2-1/16" diameter for 1", 2" and 3" hole depths, and up to 80mm diameter for 25mm and 50mm hole depths. Armor Plated Unibroach Cutters drill faster and last up to four times longer than traditional high-speed steel cutters. Multiple layers of Titanium Aluminum Nitride coat the cutter surface and protect it from wear while lowering the coefficient of friction, thereby greatly reducing the heat generated.